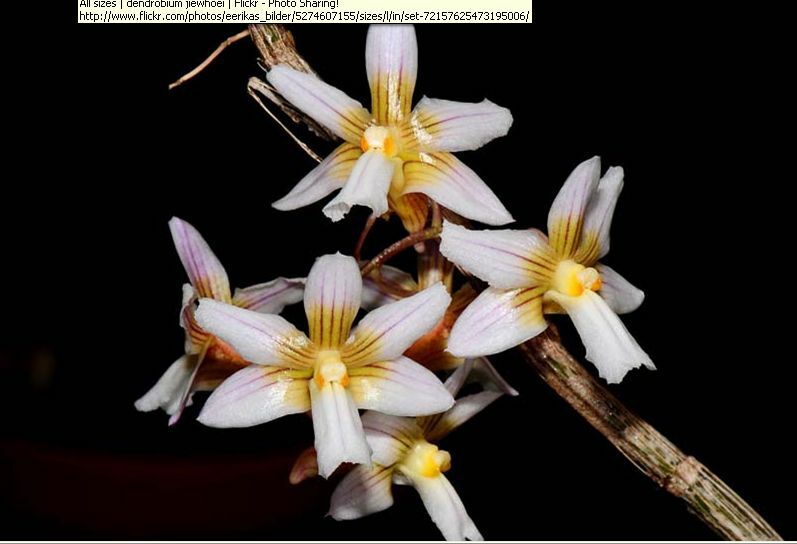 Found in Sabah and Sarawak Borneo in lower to upper montane forests at elevations of sea level to 1500 meters as a hot to cool, often pendent growing epiphyte with pendent canes carrying several, towards the apex, linear, acute, basally clasping leaves that blooms in the spring on a pendent, 1.4" [6 cm] long, few to several flowered inflorescence arising from the nodes towards the apex of the pendent stem. Similar to D derryi but D calcariferum has a pedunculate, several to many flowered inflorescence, perdominently pink to pale purple sepals and petals. Also similar to D corallorhizon but D calcariferum has generally shorter, broader leaves, the more floriferous inflorescence and the smallr, often predominently pink to pale purple lowers with a broader lip and nonretuse petals.